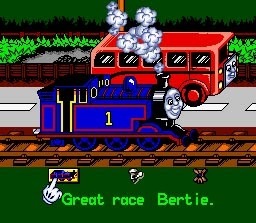 it's 'Thomas The Tank Engine', it's an awful game and the listing is for cartridge only. I'm not watching it because my three year old daughter loves the TV series. She likes playing with her train set, but I imagine she would get pretty bored answering multiple choice questions or doing 'Pipe Mania' style puzzles which is what makes up the bulk of this SNES game. I'm not watching it because it has nostalgic value, or because it has trendy or ironic box art. I'm watching it solely because I thought it would make me some money. my hope was that if it was worth significantly more than that on eBay I could buy it and sell it for a tidy profit. This was my aim but in reality I wouldn't have done this. I would have been far more likely to buy a reproduction box and add it to the collection, even though there was minimal chances of me playing it, and certainly no chance of me enjoying playing it. It's typical of how my SNES collection has been changing recently. In other posts I have talked about how I enjoy the process of findings and buying games, but recently the games I am looking for on eBay have shifted from those I desperately want to play to those that are worth money, in the hope I'll find something I know to be valuable for a low low price. This would be sensible if they were games I want, but this isn't always the case. I have found myself prioritising valuable game hunting over buying games I genuinely want to play. I've yet to find any really cheap nuggets of gold but know that if I did they would no doubt be added to the ever growing pile of shame, the tower of mint condition games I own but have yet to play. The shift from collector at the expense of being a gamer isn't a welcome one, I want to be both simultaneously. Games regardless of their current or future value are meant to be played and enjoyed. I may, one day, be keen to buy these games and Ill kick myself for not buying cheap when I had the chance. But surely that is the lesser evil when compared to buying a game I current don't want to play just because it was cheap. There was a reason I made a 'want list' it's just not something I've been thinking about too much recently. The solution to all this is simple, play the games I own before buying more. It's truly a revolutionary idea. Then if I must continue to use eBay (in the middle of the night when judgement is cloudy and anxiety sets in) I should at least narrow my search to the next game on my wanted list rather than simply searching for what's newly listed with the word "Snes" in the title. After all I can't kick myself for not buying something cheap if I didn't ever know it was available for a bargain price. After all my goal from the outset was to play games, not buy them! There is a downside to all this obvious and logical thinking. What do I do to keep myself amused in the middle of the night if not endlessly searching for games I don't need or in fact actually want? If only I had a collection of un-played games to work through! Love this post and do exactly the same thing with my PSX games. You keep looking to get one epic game but you then buy the other ones as they are cheapo. Its a weird addiction isn't it!